Prehistoric Times, as Illustrated by Ancient Remains and the Manners and Customs of Modern Savages. New York: Henry Holt, 1913. The author of this book, Lord Avebury, was none other than John Lubbock, who had published the first edition of Pre-historic Times in 1865 (see item 22); he had been promoted to the peerage in 1900, and he took his new title of Baron Avebury from a stone-age site in Britain that he had helped to preserve. 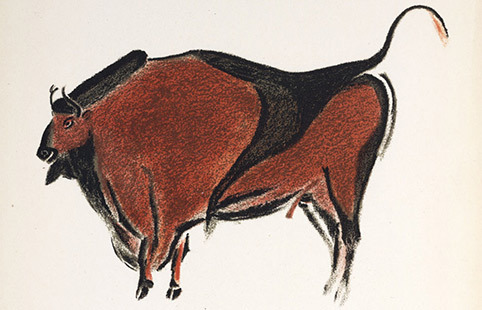 Pre-historic Times had been a best seller since its first appearance, and had gone through many editions, each one revised by Lubbock/Avebury, but this 7th edition was the first to include cave paintings. 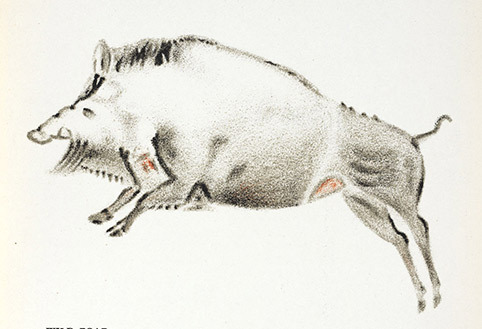 The Altamira bull appears as a frontispiece to the new edition, and we show here a wild boar, taken from the drawing by the Abbé Breuil.